spare a thought for the hapless premier league footballer. though quite likely in receipt of obscene amounts of money each game/week/month, compared with those of us who have to graft for a living, theirs is a comparatively short career, usually hanging up their boots around mid-thirties. you'd be correct in correlating this with the average career span of the professional bike racer, more often than not in receipt of an annual salary scarcely matched to the monthly earnings of the soccer chaps. however, newton's third law of motion dictates that each and every action has an equal and opposite re-action, and in certain cases this has a ring of degree of truth. for consider the hypothetical footballer introduced in my opening paragraph. when retirement beckons, unless he is gary lineker, the chances of a continuation of that career in any other form are relatively small. the best that he can look forward to is his own signature football boot, preferably in a colour other than black, with contrasting laces and a signature along the outer edge. allow a few years to pass and not only will the signature become ever more indecipherable, but the person who once scribbled it will probably no longer be remembered, a situation running probably parallel to declining sales of said boot. win britain's first olympic cycling gold medal for many a long year, or gather a sizeable collection of the very same gold awards plus a knighthood, and the possibility exists that your name could be seen on the downtubes of an entire range of bicycles. ultimately, this offers a steadier source of post career income, quite rightly built upon all those hours of excessive training while your pals were out having coffee and a danish. the most recent fellow to acquiesce to this path is scotland's sir chris hoy, a former olympian who has released many a hoy bicycle in conjunction with britain's evans cycles. however, sir chris has seen fit not to stop at the double-diamond, having subsequently set his sights on a similarly branded range of clothing, both performance and leisure. with the cycling apparel market all but saturated, it would be a brave man (or woman) who looked at a clothing start-up from scratch; far better, you would think, to ally with an existing and successful practitioner. such as nick hussey's vulpine for example. according to the hyperbole that surrounded the recent launch of hoy vulpine, sir chris investigated more than just a single possibility for collaboration, but had his eye on vulpine from the start. apocryphal though this might possibly be, it should be noted that sir hoy had frequently been seen dressed in items from the vulpine range long before hoy vulpine was ever mooted. from what seems like a particularly apt match has come both women's and men's ranges, including sports and leisure items comprising jerseys, shorts, socks, caps and t-shirts. 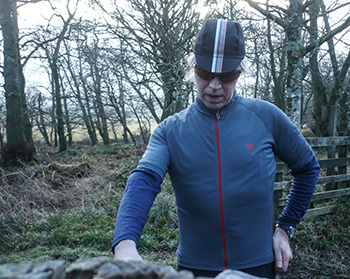 as one quite plainly in the performance end of the world (no sniggering please), hoy vulpine naturally sent a valldemosa race jersey, a pair of el toro bib shorts, stripe socks (from the casual range) and a trackside cap, all of which are remarkably sensibly priced. 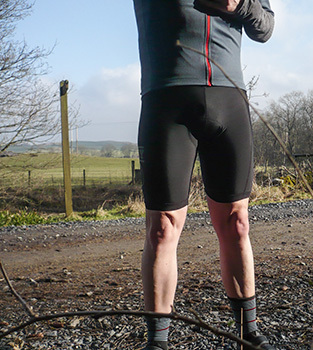 my general criteria for the fit of a pair of well-constituted bibshorts is the ease or difficulty with which they can be worn, the latter presaging the better fit. as a gent with rather a small waist, i requested the small size of el toro bibshorts, a size that frequently requires a bit of careful effort to haul past my muscular thighs (what did i tell you about that sniggering?). 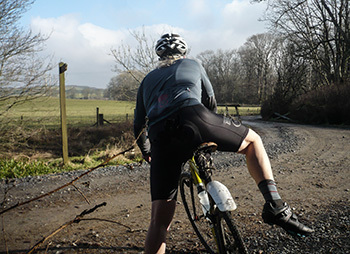 the hoy vulpine shorts are built from rather thinner lycra than inhabits the more expensive end of the market, sliding on with scarcely a whimper. i cannot deny that i thought this a harbinger of doom, the precursor of much slipping and sliding in the saddle. i cannot deny that i'd have been happier with a slightly thicker lycra, but in practice it's hard to fault either the fit or the ability of the shorts to fulfil their destiny. 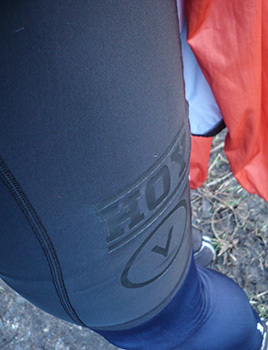 the pad is perfectly comfortable and any slipping and sliding was confined to a pair of cyclocross tyres in the mud (how else would you give new apparel a hard time?). 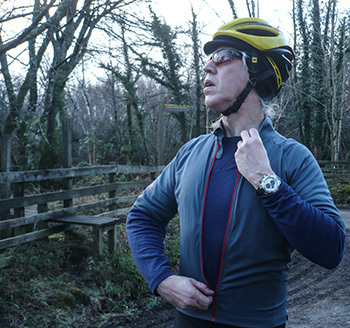 the bibs fitted perfectly well, with no signs of slippage or undue pressure on the shoulders. but i'd still have preferred a greater density of lycra if only to better hide my modesty in polite company. in full flight, however, there is no room for polite company and i have little doubt that my abilities in the keirin have been immeasurably enhanced. covering the bib section of those el toros was the subtle grey-blue of the valldemossa race jersey. once again, heavyweight is not in the vocabulary; the jersey is fabricated from a lightweight polyester. it's all very well for messrs. hussey and hoy to go cycling in the warm climes of mallorca the better to show off the fruits of their collaboration, but this more budget restricted cycling media person was confined to riding the cold, wet and windy highways and bye-ways of the inner hebrides. 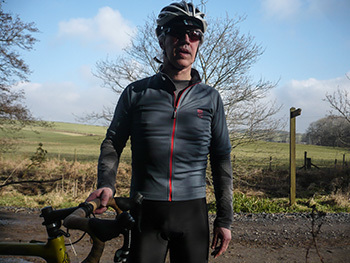 thus, though the jersey features short sleeves, i had need of wearing a heavyweight, long-sleeve vulpine merino baselayer 'neath its outer svelteness and a richard sachs shower jacket over the top. similarly, i had to wear leg warmers along with the shorts. the inquities one has to suffer for someone else's art. if i held one or two minor reservations over the shorts, other than its summer thinness, there were no perceivable barriers to enjoying the valldemossa. the fit could best be described as casual; a slim fit without emulating the race-tailoring that feels awkward unless sat on the bike, hands on the bars. despite the stretch of the fabric, gloves, pump, digital camera and a cling-filmed slice of mrs washingmachinepost's christmas cake fitted easily into the three rear pockets and stayed put, no matter the trouble i got myself into while passing myself off as jeremy powers. admittedly the centre of the three has little space for more than a mini-pump, but overall, carrying space is adequate. the tag on the full-length zip makes it simplicity itself to adjust the air conditioning, while its subtlety in the face of performance enhancement kept me stylishly anonymous at the coffee stop. it may be somewhat reactionary to pair hoy vulpine stripey socks pulled from the casual range, with the fast stuff, but in mitigation, those legwarmers and overshoes hid this potentially sartorial faux pas from public view. my feet were happy at this situation. the fabric ribbon down the centre of the trackside cap matches the general colour scheme evinced by that jersey zip tag, but in the grand scheme of things, it's still just a cap. disappointingly, though we all know that real men ride with the peak down, the hoy vulpine logo is screened on the lower portion, obscuring it from view. to my mind, this is taking subtlety just one step too far; i want the logo on the top for all to see. i figure the proof of the hoy vulpine pudding may well come in their autumn/winter range later this year; on the basis of this opening salvo, i'm looking forward to october already. the hoy vulpine valldemossa race jersey is available in orion blue, black/orion blue and cobalt blue/red in sizes ranging from small to xxl. retail price is £69.99. the el toro bibshorts can be bought in small to xxl, only in black/charcoal at a retail price of £79.99. 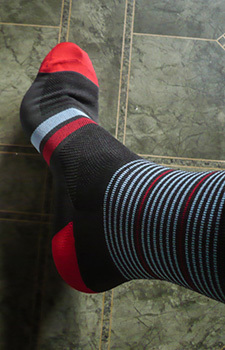 the stripey socks are £11.99 per pair in sizes small to xl. the black or gold trackside cap eschews the 'one size fits all' classification, available in small, medium and large for £11.99.